Even before the bodies had been counted or the perpetrator named, before an overheard shout relabeled the killing from a road-rage incident into a terrorist strike, one thing was clear: The horror on the Hudson River Greeenway was an attack on pedestrians and cyclists. It was also eminently preventable. Sayfullo Saipov’s guns were fake, but his truck was real, and he used it to drive block after block after block, unimpeded by car traffic, free to crush Citi Bikes and their riders. He could do so because this ostensibly “protected” bike lane … isn’t. Sanitation workers and road crews access the path through openings that are, well, wide enough to drive a truck through. Anyone who regularly rides that way knows to watch for garbage trucks, maintenance workers’ golf carts, police cruisers, and Con Ed vehicles blocking a lane. In recent years, guided by Mayor Bill de Blasio’s allegiance to Vision Zero, the city keeps doling out new bike paths that are separated from ordinary traffic by raised curbs or parking spaces, or else just indicated by stripes of paint. That’s not enough. We should have learned by now that when drivers don’t do what traffic-flow simulations say they should, they can do immeasurable harm. 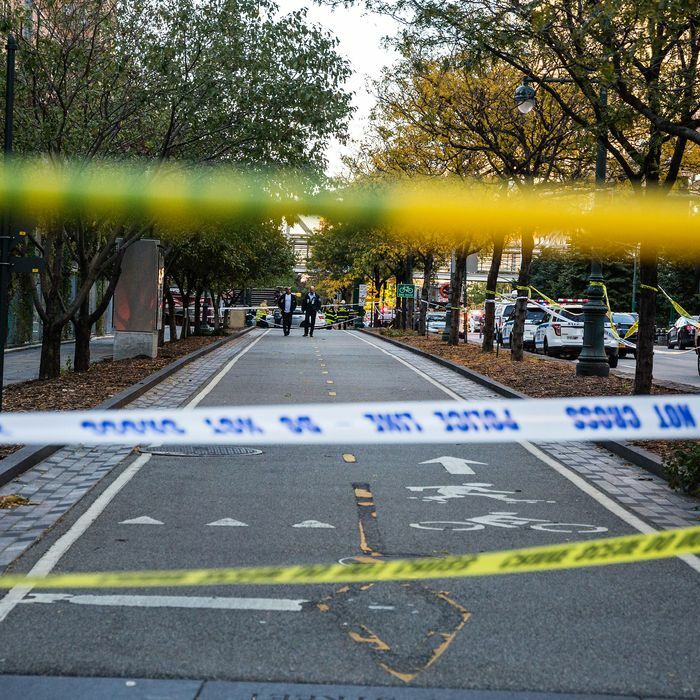 We’ve seen it before, in virtually the same place: in 2006, a drunk driver wandered onto the Hudson River Greenway at Chelsea Piers and sped downtown for more than a mile before hitting and killing a 22-year-old cyclist, Eric Ng. (That was the second fatal accident on the path that year.) “To do so,” the Times reported, “he had to drive over or around a narrow, three-foot plastic pylon” — the same sort of brittle non-obstacle that failed to stop Saipov. We can’t crazy-proof all of New York, but the city could do a far more thorough job of safeguarding places where cyclists and pedestrians cluster. The solution is a thin steel bollard, strategically placed and quickly unscrewed if necessary. When Richard Rojas gunned his car through Times Square last May, he wound up impaling it on precisely such bollards arrayed around a pedestrian plaza. Had more of them been installed along the crowded curbs, he would never have been able to mow down dozens and kill 18-year-old Alyssa Elsman. He probably wouldn’t even have tried. Berlin, Barcelona, Nice, London — the roll call of mass murder by vehicle keeps getting longer, yet that simple intervention somehow never seems urgent. Well, almost never: Last summer, spooked by an ISIS video showing the Strip thronged with people on foot, Las Vegas accelerated a plan to install 700 curbside bollards. When an attack did materialize in that city, it came in the form of hellfire rained down on the city from a high-rise hotel. But terrorists have learned that they don’t need elaborate arsenals to inflict appalling damage. And while the nation keeps wrestling with the question of how to stop mass shootings, workers are quietly fitting out the Strip with an inconspicuous, uncontroversial, and reliable line of defense against the next monster seated behind a wheel.